Murray Bookchin was an American libertarian socialist author, orator, and philosopher. 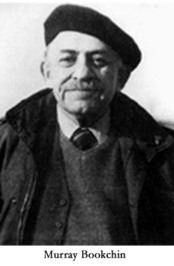 A pioneer in the ecology movement, Bookchin was the founder of the social ecology movement within anarchist, libertarian socialist and ecological thought. He was the author of two dozen books on politics, philosophy, history, and urban affairs as well as ecology. In the late 1990s he became disenchanted with the strategy of political Anarchism and founded his own libertarian socialist ideology called Communalism.